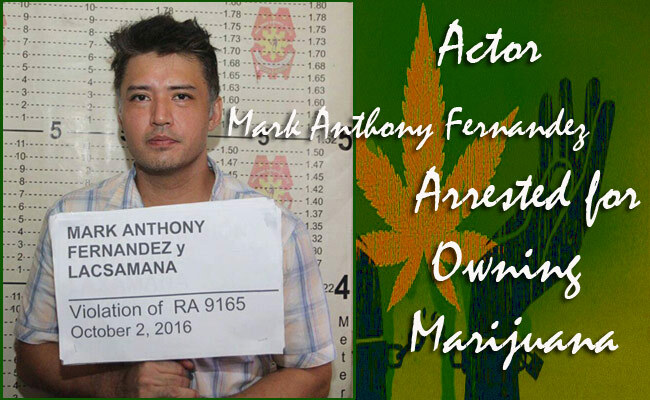 Actor and former matinee idol Mark Anthony Fernandez was arrested by an Angeles City Police last Monday night during a checkpoint at MacArthur Highway. He tried to sneak away from the checkpoint that the police then chase him and was force to shoot the wheel of the actor’s Ford Mustang car. Fernandez was forced to stop when there was a heavy traffic to San Fernando, Pampanga. As stated by Supt. Sydney Villaflor, they found a kilo of marijuana, which is still prohibited in the country worth Php 15,000. As of this typing, the actor was arrested at Station 6 in Angeles City Police District with a violation of Comprehensive Dangerous Drugs Act. On his defense, Fernandez was interviewed by the media and revealed that the marijuana seize from him is a one-year supply as a remedy to prevent cancer. He also divulged that he doesn’t have any unauthorized drugs when he was captured by the police officer and he was just about to buy marijuana from his dealer who avoided from being detain. Fernandez then stressed that he was not arrested at the checkpoint. Just this morning around 6:30, he was brought at the PNP Crime Laboratory in Angeles City to undergo a drug test and a urine sample was only needed. After the test, he will return to Station 6 and according to a report, Fernandez was cooperative with the authorities. The first time the actor got involved in drugs was last 2004 when he volunteered to enter a Rehabilitation Center at Bicutan and later returned in show business after 6 months. He is the son of the late action star Rudy Fernandez and actress Alma Moreno. Fernandez rise to prominence during 90s when he became a member of Gwapings alongside Eric Fructoso and Jomari Yllana. He then appeared in GMA shows like Beautiful Stranger, Rhodora X, and Juan Happy Love Story. His last project was the critically-acclaimed movie Ma’Rosa.